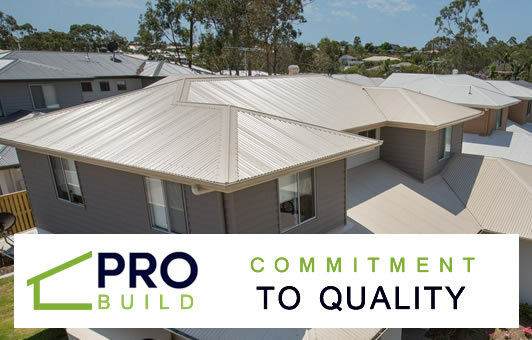 At Pro Build Roofing Brisbane we connect you with highly experienced roof contractors that guarantee premium quality services. We understand the importance of providing a highest quality products, we supply expert tradesman and awesome customer service you can count on. Couple that with great deals at affordable prices and you have a roofing service that delivers value without comprising on quality. Contractors we provide give you the best range of services, from re roofing your entire house right through to replacing your old gutters and installing insulation. With over 10 years in the industry every contractor is experienced and knowledgeable. They’ll help deliver your project on time and on budget. We handle a wide range of services to suit with residential home and commercial property owners. For free advice or if you have any questions get in touch with our contractors today or send us your details using our quote form on the right and we will be in contact with you the same day. We service the following areas: Brisbane Northside, Southside, Western Suburbs, Toowoomba, Ipswich, Sunshine Coast, Gold Coast, Tweed Heads. Metal Roofing is a great choice for a long lasting and smart appearance. Be the envy of your neighbours with our amazing metal roof choices. Our reroofing services are second to none. We provide experienced tradesman using high quality products for both residential and commercial properties. If your gutter system is leaking or simply looking tired and worn out then it might be time for a replacement or repair. We have a large range of new guttering to choose from. Asbestos can be extremely dangerous to you and your families health. If you believe your home has asbestos contact our removals team for a free inspection. Very impressed Thank you so much for the hard work you guys put into our new colorbond roof. I felt sorry when it was 35 degrees outside and there was no protection from the sun! You really did an amazing job, the house looks so much newer and my husband is thrilled to bits. Great work. Thanks for the pre sales consultation and time you spent with us before we proceeded. It was re assuring to know you were there to answer all the questions we had about our restoration and offered great advice on getting the best long term results for our investment, I highly recommend Pro Build Roofing. At Pro Building Roofing Brisbane we understand that our success is a reflection of our customers satisfaction. We promise to always offer the following as part of our commitment to service. We will provide our best pricing possible – We may not always come out the cheapest but we believe our level of service is among the best. For your free consultation get in touch with our friendly team.